Lots of beautiful knitted accessories from Yiskah Knits - quality knitted items from the UK! Jessica uses natural fibers and materials so you're ensured quality items! 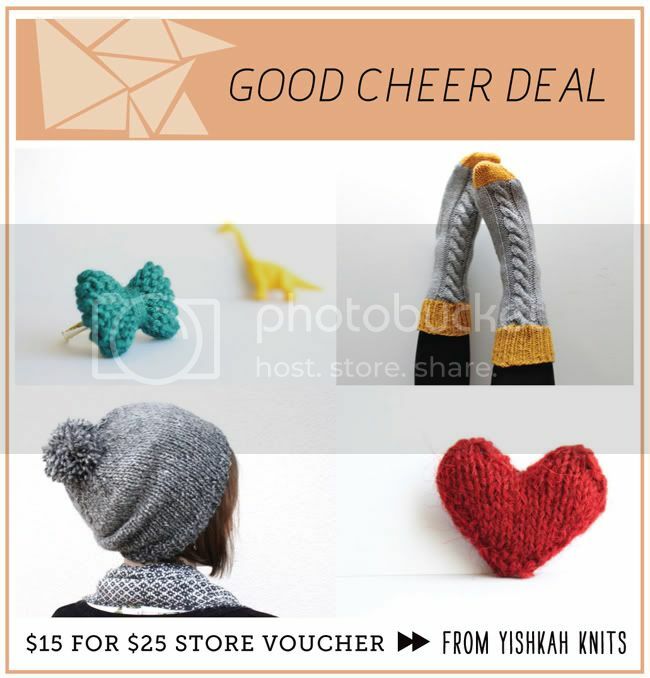 This week's voucher is for a $15 for $25 good on anything toward Yiskah Knits ! Be sure to stop by Jessica's blog and follow her on twitter! To purchase this deal, click the Paypal "buy now" button below! - To redeem your voucher: Select the items you'd like purchase, proceed to checkout, and select "other" as your payment option. In the "Note to Seller" box, be sure to include this message: "I purchased a voucher at oh, hello friend Good Cheer Deals worth $25. My paypal address is (enter your paypal address here)" If you exceed the voucher amount, a Paypal invoice will be sent to you for the remaining amount. - Click the 'buy now' button to purchase this deal. Simply use your paypal account to make payment directly to seller. If the 'buy now' button is no longer working, it means the item is sold out. ps. Want to join a growing bloggerscommunity? To unite bloggers!! The red heart is so cute!!! !